It was not the best couple of weeks for progress on the Visual Novel. Fred and family were away for a few days. Then when he got back, he had some frustrating struggles trying to get finished with the rest of the scenes in Tsubasa’s apartment. We will be making another couple of process changes to try to improve things going forward. He did get some stuff done though. As I mentioned before, I am doing the initial ren’py scripts based on Fred’s storyboard thumbnails, and then Fred has been tweaking the script and drawing the artwork. The above screenshot is one example. 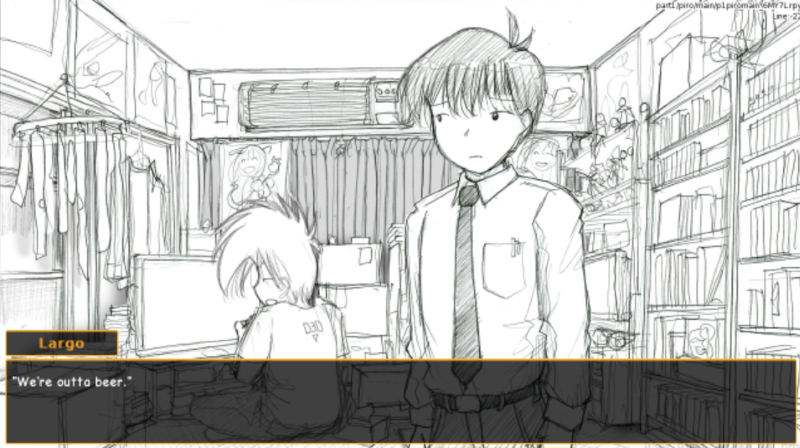 The initial script had Largo enter standing on the left opposite Tsubasa. Having him in the background playing games works better. It’s a good change. But Fred is finding those kind of script code changes difficult in practice. He’s making mistakes and misreading the code, which takes time and leaves him frustrated. That’s not surprising. Fred’s a smart guy, but he’s a comic artist, not a programmer. He can do it; it’s just not easy for him. To try to improve this, Fred will be doing less code tweaking himself, and will instead tell me or Shad0w what he wants changed and we’ll code it for him. Hopefully this will leave him less frustrated and give him more time to draw. Up till now, we have been letting the script drive what artwork Fred needs to draw. This was intended to limit the character drawings that Fred had to make to only those that were actually used. We’re finding though that this is allowing us too much freedom in specifying the artwork in script, which ends up making Fred do more artwork. Fred hit one of those this past week, where he drew a new Tsubasa facial expression, but found the result nearly identical to one that he had already drawn. It was a frustrating waste of time and effort. To try to minimize this going forward, Fred is going to draw a core set of character images, in the common standing position, with common facial expressions, and with the common torso, head, eye, and mouth positions. Then when I do the initial scripts and Fred tweaks them, we will first see if one of those core drawings will work, before we specify something new. Hopefully this will result in fewer total character drawings in the end. In other Visual Novel news, Shad0w has been working on the minigames, Klange has been working on the data infrastructure to support them, and DarkMorford has been working on overall organization. It sounds like they are coming along nicely. TheShaggyFreak has posted some more samples of the background music to the Beta section of the visual novel forum. If you are a registered beta tester, go check them out. Chemiclord had done a little more writing for some filler areas and for the branch and alternate routes. But he is currently laid up with serious back problems, which has made things difficult. Please keep him in your thoughts. Fred’s son Jack starts school this week, which should give him more time to draw. 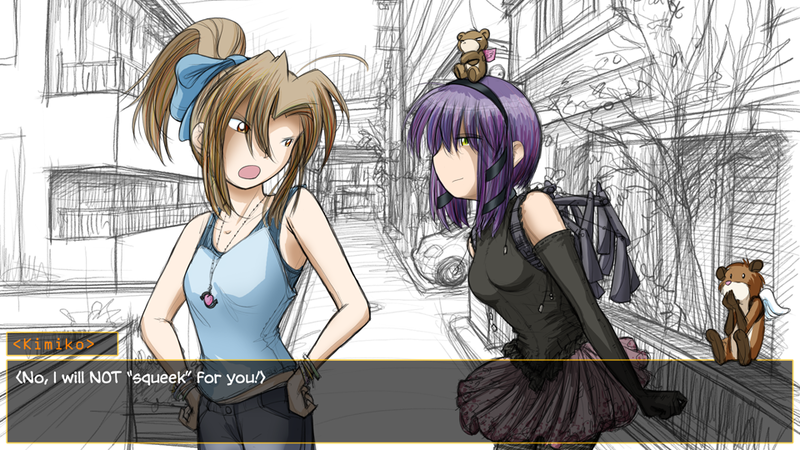 We’re hopeful that and our process tweaks will get the Visual Novel production cranked back up again. Fred is also looking at reopening the MegaGamers store reasonably soon, though his T-shirt printer remains out of commission and he’s still struggling to decide what to do there. This entry was posted in Visual Novel on August 30, 2014 by paarfi.